Former Trump campaign chairman Paul Manafort's flight records show that he traveled to Moscow at least 18 times while advising the pro-Russian strongman Viktor Yanukovych, who later became Ukraine's president. Yanukovych fled to Russia in 2014, but Manafort continued advising Ukraine's Opposition Bloc — a political party that is considered even closer to the Kremlin than Ukraine's Party of Regions. 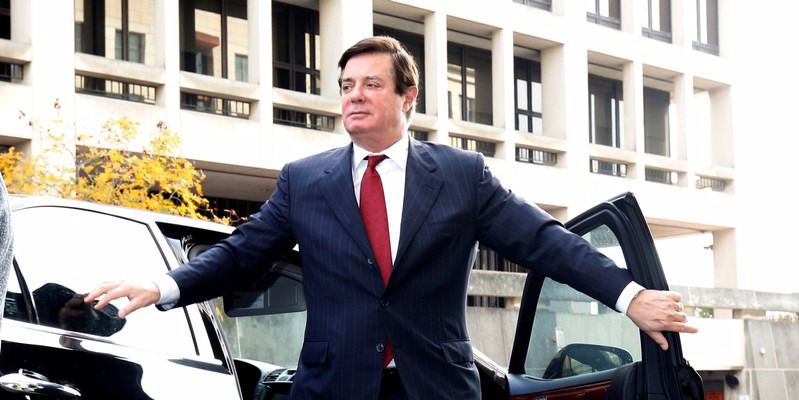 Quote: President Donald Trump's former campaign chairman, Paul Manafort, traveled to Moscow at least 18 times between 2004-2011, while he served as a top adviser to ousted Ukrainian president Viktor Yanukovych and the pro-Russia Party of Regions. The flight records, which were obtained by McClatchy News from a government source in Kiev, suggest that Manafort's consulting work and business dealings were more closely linked to Russia than he has let on. Manafort visited Ukraine at least 138 times between 2004-2015, according to McClatchy. He traveled to Moscow the most between 2005-2006, but took additional trips there through 2011. Yanukovych was ousted in 2014 amid widespread protests over his last-minute decision to reject a deal that would have fostered stronger ties between Ukraine and the European Union, and instead pursued closer ties with Moscow. Yanukovych fled to Russia when the protests escalated, but Manafort continued advising Ukraine's Opposition Bloc — a political party that is considered even more pro-Russia than the Party of Regions. Manafort's business dealings with Russian and Ukrainian oligarchs have come under intense scrutiny by special counsel Robert Mueller as part of his investigation into potential collusion between the Trump campaign and Russia during the 2016 election. Manafort's trips to Russia are not the only ones that may be of interest to Mueller. He and his longtime Russian-Ukrainian business associate Konstantin Kilimnik reportedly traveled to Frankfurt in July 2013 on a private plane owned by Andrey Artemenko — a Ukrainian lawmaker who met with Trump's lawyer, Michael Cohen, and longtime Trump Organization adviser Felix Sater in January to present them with a Russia-Ukraine "peace plan" that involved easing sanctions. A federal grand jury indicted Manafort and his longtime business associate, Rick Gates, in October on 12 counts, including money laundering, tax fraud, and failing to register as foreign agents. Federal prosecutors said in a court filing that both men had received "millions of dollars" from Ukrainian and Russian oligarchs that would allow them "to live comfortably abroad" and therefore make them a flight risk. Citing financial documents filed in Cyprus, The New York Times reported in July that Manafort was in debt to pro-Russian interests by as much as $17 million by the time he joined Trump's campaign team in March 2016. Manafort also has significant business ties to the Russian billionaire Oleg Deripaska, who signed a $10 million annual contract with Manafort in 2006 for a lobbying project in the US that Manafort said would "greatly benefit the Putin Government," The Associated Press reported in March. Manafort's spokesman Jason Maloni told Business Insider that airplane records "do not demonstrate anything other than Mr. Manafort was in Moscow for his well-known commercial work with Oleg Deripaska or was connecting through Moscow on his way to and from the US." In July 2016, Manafort offered private briefings about the campaign to Deripaska in the hopes of resolving a years-long business dispute stemming from a failed business deal the two pursued in 2008 involving a Ukrainian TV company called Black Sea Cable. Legal complaints filed by Deripaska's representatives in the Cayman Islands in 2014 said he gave Manafort $19 million to invest in the company, but the project fell through and Manafort all but disappeared without paying back Deripaska. Deripaska's representatives were "openly" accusing Manafort of fraud and pledging to recover the money from him as recently as early 2016, according to the Associated Press. But they reportedly backed off the accusations shortly after Manafort joined the campaign in the spring. Shortly after being named a campaign strategist in April, Manafort emailed his longtime employee Konstantin Kilimnik, a Russian-Ukrainian operative with suspected ties to Russian intelligence. Russia-linked entities dangled compromising information about Clinton to the Trump campaign at least twice after Manafort was enlisted to corral convention delegates in March 2016. The campaign's stance on Russia's interference in eastern Ukraine did not seem aligned with traditional GOP orthodoxy, either: An amendment to the GOP's draft policy on Ukraine, which proposed that the GOP commit to sending "lethal weapons" to the Ukrainian army to fend off Russian aggression, was ultimately softened to say "provide appropriate assistance" before it was included in the party's official platform in 2016. The Trump campaign also did not provide a letter to the Ukrainian Congress Committee of America recognizing Ukraine's 25th year of independence after the fall of the Soviet Union, according to McClatchy. The Clinton campaign did. A young campaign foreign policy adviser named George Papadopoulos was told in late April that the Kremlin had "dirt" on Hillary Clinton in the form of "thousands of emails," according to court documents filed by Mueller and unsealed late last month. Papadopoulos asked Manafort in an email on May 21, after learning of the dirt, whether he could arrange a meeting between Trump and Russian officials: Russia has been eager to meet with Mr. Trump for some time and have been reaching out to me to discuss," he wrote. Manafort forwarded that email to Gates, adding: "Let's discuss. We need someone to communicate that DT is not doing these trips. It should be someone low level in the campaign so as not to send any signal." A few weeks later, Manafort attended a meeting at Trump Tower on the promise of obtaining similar Clinton "dirt" from a Kremlin-linked Russian lawyer. Manafort's prominent campaign role and history of working with Ukrainian and Russia-linked entities apparently spurred the FBI to seek a FISA (Foreign Intelligence Surveillance Act) warrant to surveil him at least twice between 2014-2016. Manafort resigned as Trump's campaign chairman shortly after The New York Times reported that the pro-Russia political party he had worked for had earmarked him $12.7 million for his work between 2007 and 2012. Ukrainian prosecutors have said they've found no proof of illicit payments to Manafort, who has said he never collected the payments.